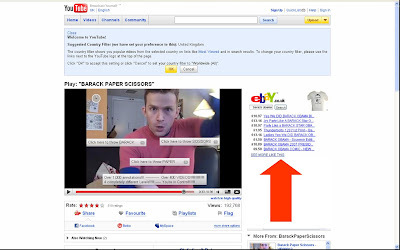 Barack Obama Ebay ads on YouTube? I have subtly indicated the Barack Obama Ebay listings with a red arrow in the image above. With the recent YouTube 'Click to Buy' additions and now this, maybe the future for YouTube monetisation is Affiliate programs rather than display or CPC models?